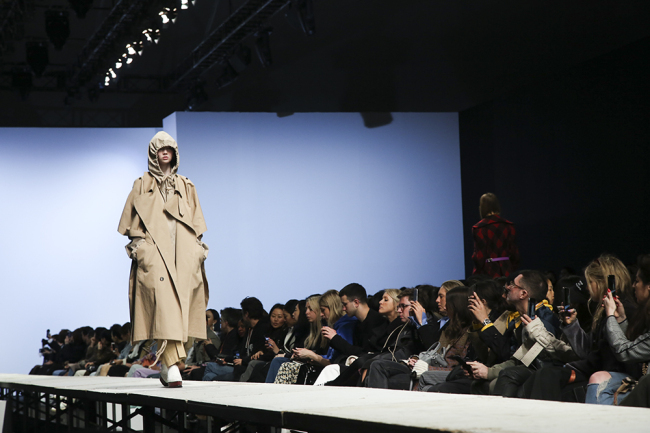 Despite heavy snow, a fashionable, passionate crowd gathered at Dongdaemun Design Plaza on Wednesday to enjoy the second day of the 2018 fall-winter HERA Seoul Fashion Week. 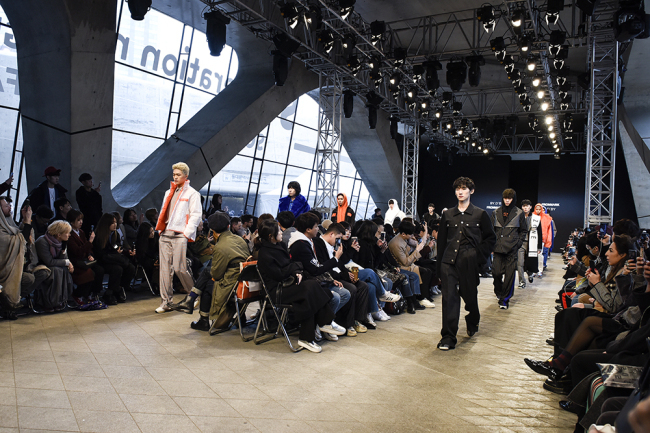 Various local brands staged creative shows, providing the audience the chance to observe Korea’s fashion industry at the scene. Following are three highlights of the day. Ordinary People went experimental, making use of various materials typically considered unfit for garments. A brilliant laser performance kicked off the show in accordance to the beat of the music to set the vibe. Shiny patent leather was used as the main material -- for a jacket, coat, hat and even pants. The overall concept of the outfits was boldness, utilizing metallic textiles with vivid hues of red and yellow. Many of the male models donned see-through shirts embroidered with cubic jewels inside bold leather jackets. The mix-and-match look seemed to blur the lines of masculinity and femininity. Although Ordinary People is a menswear brand, celebrated female model Kang Seung-hyun graced the runway, wearing genderless garments. 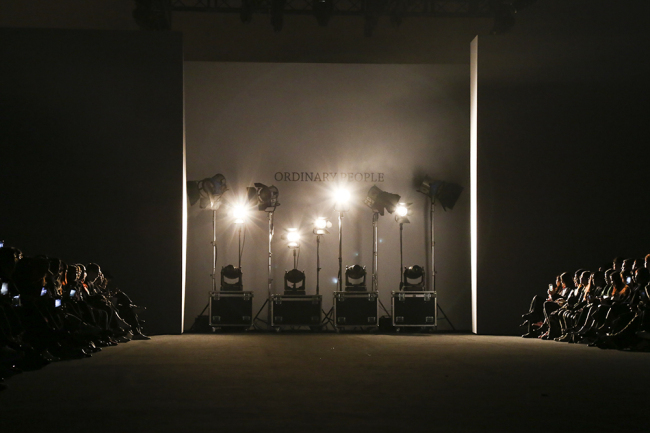 Fashion designer Jang Hyeong-cheol of Ordinary People aims to give attention to the extraordinariness of ordinary people, saying, “We are all ordinary and extraordinary.” The fashion house hopes to bring out customers’ specialness in its clothes. Jang has collaborated with various K-pop acts, including BTS and GOT7. The crowd at the show was sent straight back to the ‘90s, albeit a more glamorous version of the grunge decade. Continuing to showcase the brand’s signature style and oversized tailoring, outerwear with oversized shoulders walked the runway. Voluminous shirt dresses and drawstring trousers -- symbolic touches of the designer -- were spotted as well. The standout ensemble was a two-piece suit in unique materials and eclectic prints. The jacket and knee-length skirt was heavily influenced by retro fashion, but moderated with futuristic elements of a metallic lavender. Vintage-shaped sunglasses with tinted color lens placed the show’s mood into a co-existence of past and future. Designer Park Seung-gun is often inspired by elements from both the past and an imagined future. His collections are focused on “crossing time and generations.” He hopes to create clothing for people who want to play with their style. Colors ruled the runway of BY.D’BY. The show was filled with vividness. While a model donned everything in blue, another was dressed in orange from the head to toe. But despite the bold use of color, the show did not overwhelm, as the colors’ saturation and intensity were similar. Black looks were also showcased. The black-themed looks were moderated with enamel pins and buttons, keeping up the collection’s light atmosphere. Some 16 models walked the runway in wide-hemmed pants long enough to fully cover the top of the foot. Led by designer Song Bu-young, BY.D‘BY creates a street avant-garde look, mainly centering on the use of achromatic colors while allowing variations.